“Self-published” is, I’d wager, the phrase most likely to strike fear into the heart of even the most ardent book-lover. After all, that’s how we had Fifty Shades of Grey inflicted upon us, and the rise of ebooks (a great thing as far as I’m concerned, as look at the number of classic crime titles now available via that medium) has given new scope to the possibilities for getting a book out to an audience without first taking a detour via editors, proof-readers, fact-checkers, or any of the countless bastions of velleity that could previously be taken as read upon picking up a book. 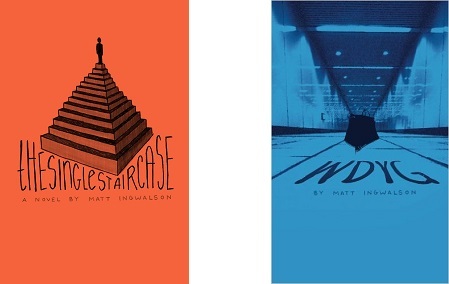 However, just as Patrick Ness has shown us that not everything labelled YA need be treated disdainfully, so self-publishing will produce the odd gem, and Matt Ingwalson’s duo of impossible crime novellas featuring detectives Owl and Raccoon definitely fall into this category. And, as it’s Christmas and you’re likely to be busy people, I’m flashing them up now as a recommendation for a couple of quick reads to fit in between the chaotic scenes of this festive period (or, y’know, any other time that suits). Both are impossible disappearance stories: The Single Staircase concerning a young baby that vanishes from its room when the only way in or out was the stairs into the lounge where her parents were watching a movie, and WDYG revolving around a teenager vanishing from a shopping mall while out with her friends. Each is probably around 100 pages long, split into very short chapters (anything from two lines to a couple of pages) and, honestly, Ingwalson does a lot more with his characters in this short space than many other authors have managed in a decades-long series. Owl and Raccoon – no-one ever calls them anything else – have a sense of sadness and determination about them that is rather marvellously handled, and the noirish underpinnings of the narrative and the sharpness of the dialogue are intelligently worked in both stories. This is not mere posturing for posturing’s sake, it’s extremely good writing. Of course, they’re also barreling narratives and crime stories, so that aspect must hold up too. Of the two, I prefer The Single Staircase: it is superbly worked and motivated, contains at least two potential false solutions and is tremendously sad when you get down to it (and, yes, is still only around 100 pages long). WDYG is the better-written of the two, though, and perhaps not unexpectedly so, and while the impossible element is a little transparent there’s a very subtle piece of clueing that I missed completely (and it’s not like I’ve ever written anything for publication, let’s face it) and again a good, pleasingly unconventional, motivation behind everything. I’m tagging this as a review, but it’s hard to rate them because they’re doing something very different to the usual focus of my blog. Hopefully the fact of my recommending them is enough for you to draw your own conclusions. Ingwalson has written some other, non-impossible, noirish stories, and I also have it on pretty good authority that more Owl and Raccoon is on the way so get involved now while he’s still hip and unknown. If he ends up the next Dan Brown you’re not going to be impressing anyone now, are you? Both these – and all Matt Ingwalson’s other writings – are available through your country’s version of the world’s favourite evil corporation (nah, I’m kidding, Amazon, I love ya: for devising the Kindle Paperwhite alone you can dodge all the tax you like…). Self-publishing comes off like fanfiction to me, in a sense. * Most is dreck, but if you know how to look and where, you can find some gems. Like these! I’ve had no problems with those sites at all; no fear, it would alter my standing somewhat more than my dislike of Mitchell alrady has to link to known virus-nests (though I do understand your particular anxiety of viruses! )…in all good faith, they’re fine. And, shock horror, I did actually email you a couple of days ago! I know, right? Phew. I’ll check them out at some point then.